Help free a cursed village. Crestshade — Save Crestshade from the Argonian's blood curse. The town of Crestshade has been subjected to a blood-curse that turned the townsfolk feral. While some refugees were able to escape to the south, the mayor remained behind to aid any survivors. Head to the town of Crestshade and speak to the spirit of Mayor Gette. Retrieve personal items of the mayor, the mage and the scholar. Go to the chapel crypts and witness the ritual. I should make my way to the town of Crestshade and see what's going on. Strange creatures overrun Crestshade, and it looks like part of the mountain came down upon the town. I should find Crestshade's mayor. She may be taking refuge in one of the houses. Mayor Gette asked me to talk to two other spirits: Mage Tharlas and Scholar Jonne. If I find items of personal significance to these three spirits, they can use them to focus their energy and lure out the abomination that wears their flesh. I have the skull of the wise scholar, the devoted mayor's Badge of Office, and the staff of the brave mage. Now I should go to the ruined chapel and enter the crypts. I need to place the focus items on the altar to draw out the abomination Reezal-Jul created. Then I can destroy the creature and set the spirits of Crestshade free. I destroyed Reezal-Jul's abomination. Now I should talk to the spirit of Mayor Gette. I should take the items used in the ritual and bury them in hallowed ground. 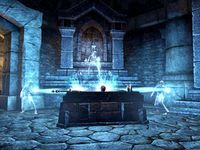 I should find a suitable spot in the Crestshade graveyard to bury the personal items of the mayor, the scholar, and the mage. Finishes quest With the help of some strong, determined spirits, Reezal-Jul's abomination was destroyed. Sadly, Crestshade is now a ruin as well. I should tale to the mayor one last time before she departs this world.